The Xenon Trap Monitor continuously monitors trap effluent during a xenon study, meeting compliance requirements in most states. An exhaust hose connects from the Pulmonex II exhaust port to the Xenon Trap Monitor’s intake port, making it the perfect complement to the Pulmonex® II Xenon System to ensure a safe environment. The Xenon Trap Monitor is simple to operate; all controls are located on the front panel. Counting results are displayed with both audible and visual signals to indicate when the xenon trap exhaust port exceeds the threshold of 99 pCi/mL.The unit can also check background levels and perform a self-test for proper operation using a check source (a 10 µCi Cs-137 Check Source is required to calibrate the monitor). 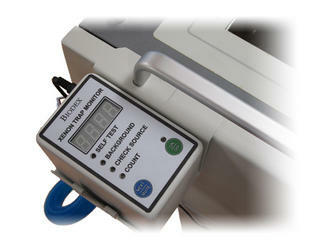 The Xenon Trap Monitor includes all the hardware necessary to mount the unit directly to the Pulmonex® II Xenon System.